If you have just received or are soon getting a brand new 2018 Retina MacBook Air anytime in the near future, don’t miss out on an important supplemental software update that is available for the machine. 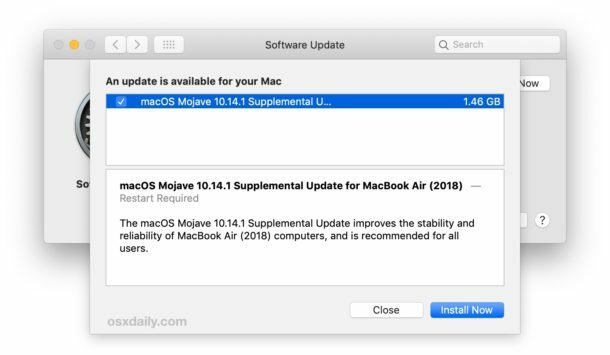 Apple has issued the supplemental software update specific to the new Retina MacBook Air, labeled as “macOS Mojave 10.14.1 Supplemental Update for MacBook Air (2018)”, and it’s available immediately. Given that the new MacBook Air ships (as of this writing) preinstalled with macOS Mojave 10.14.1, the update is not merely the same MacOS 10.14.1 update available for general Mojave users. This could indicate some optimization was made specific to the machine, or perhaps a bug or issue was discovered that is resolved with the supplemental update specific to the new MacBook Air. Or the software update could be for some other purpose. Remember, updating system software in MacOS is done through the ‘Software Update’ control panel within System Preferences, which you can find through the  Apple menu. Installing the supplemental update requires a reboot to complete. If any additional details about the “macOS Mojave 10.14.1 Supplemental Update for MacBook Air (2018)” are found, we’ll update this post with more information. Likewise, if you have any info about this update, or any others you see in the software update control panel of Mojave, feel free to share below in the comments. But in the meantime, for new Retina MacBook Air users, go ahead and install the supplemental update. Update: Retina MacBook Air (2018) users can also choose to download the “macOS Mojave 10.14.1 Supplemental Update for MacBook Air (2018)” package directly here from Apple. I’m not sure it’s just for the macbook air – I just got a very similar update for my macbook pro. Is this a firmware update? My screen flashed when it was installing and it says the screen will go black during install. Hmm, any chance? And maybe MacBook Pro too? I got the new retina air. It’s beautiful! This screwed my MacBook Pro (2011) up ferociously. The technical help told me, over the phone, that it was only for computers that were newer than 2012. She actually told me that there would be no future operating system updates for computers before 2012. Seemed fishy, but what do I know? @Carl what happened? Did you get a Supplemental Mojave update for a 2018 computer on a 2011 model somehow? How was It versioned and labeled? Are there multiple Supplemental Updates available? There is nothing to be found online about this as I search, I could use the knowledge for IT and work tomorrow. I’m not sure, @MacDan. I can’t get to my desktop anymore. I’m an amature with things like this, leading me to two lengthy calls to Apple, but I’m hoping I can get back to work in safe mode tomorrow morning. This update was a bummer for my old MacBook Pro. It would have been a nice note to add to the update that it wasn’t for everyone. The update is labeled as a supplemental update for MACBOOK AIR 2018, that is pretty clearly not for everyone. It is for MacBook Air 2018. How did you even manage to get the MacBook Air update on your MacBook Pro? So many questions here… very confused. I received the supplementary update on OS X 10.14.1 running on my Mid-2013 MacBook Air.. took quite some time to download, and took an equally long time to install..
After installation, HandsOff! stopped functioning. I wonder what undocumented changes they implemented.. I also got the update on a new Mac Mini, but it’s running fine. Interesting good to know, how do you like the new Mac Mini? I replaced my 2016 Macbook Pro with it as my daily driver. Wow that sounds like an amazing Mac! I picked up the 2018 Retina MacBook Air, it’s quite nice in the BTO 16GB/512GB configuration. I just ordered the exact same build. I have seen a few comments about a slightly dim display on this item. Any issues with yours? I really like it, it’s a pretty great little Mac! The design is very modern and premium. As for the display, Retina looks fantastic. I’ve seen those comments too, I think the dim display commentary are relative to the newest MacBook Pro, which apparently has an extremely bright display. I’m coming from a 2015 MacBook Pro 15″ (which I still use, love, and adore BTW) and the brightness between the two screens doesn’t seem too different to my eyes. I did custom calibrate the display after I got it for a slightly darker gamma, but that’s my personal preference. I treated myself this year! Bought the new Mac Mini, a CalDigit TS3 Plus Dock, an AmpliFi Instant Wifi System by Ubiquiti Labs, a new Satechi Aluminum USB Wired Keyboard and a Logitech G502 Proteus Spectrum RGB Tunable Gaming Mouse. Throw a couple Apple TV’s in there too. This fits well with my 3 other physical Macs and my 4 VM Macs. (One runs on my ESXi Server). All get backed up to a Synology DS918 and a DS916 using Time Machine. (One runs on my ESXi Server). All those toys keeps this retired computer geek quite busy! Now THAT sounds like a great Mac setup! I’ve been thinking of getting one of those Synology NAS… now you’re tempting me. Haha! As for waiting for a 4k/5k display, I’m with you. Hopefully Apple comes out with one this next year with some more pro level updates and hardware. Fingers crossed!